The bitter cold does not seem to be letting up as we enter February, except perhaps more rain. Now while museums and landmark tours are a great way to have a day out, here are some suggestions if you want to stay out of the cold but do something a little more action-packed! You can repetitively swim lengths to build fitness and stamina OR you can instead go to a waterpark and go hurdling down a slide. There are multiple parks throughout Ireland, and during off-peak times in parks such as AquaZone, there are ticket price reductions as well as student prices. See also: Waterworld Bundoran (Donegal), WaterPoint (Sligo), Funtasia Waterpark (Louth), Trabolgan (Cork) and Kilkee Waterworld (Clare). If you want a combination of the physical challenges of Skill Zone and puzzle solving from Adventure Rooms, check out GoQuest in Dublin or Boda Borg at Lough Key Forest Park, which combines timed physical and mental challenges as you go from room to room, with different levels of difficulty - just like The Crystal Maze. One of Irelands most popular escape room centres. Using problem solving and team work skills to challenge and solve puzzles. You have 60 minutes to solve all the puzzles and successfully escape the room. From being captured by evil queens, to world travel to mafia bosses, there are several room themes to choose from at Adventure Rooms. See also: Escape Dublin, The Clockwork Key, Escape VR, Escape Boats, 5 Quests, We Escape (Dublin), Great Escape Rooms (Galway), Éalú Escape Rooms (Mayo), Albatross Escape Rooms (Cork) Escape Rooms Derry, Forbidden Quest, Timescape, GoT to Escape, Escape Rooms Ireland (Antrim), EXIT (Westmeath), Escape Limerick, The Great Escape (Waterford). Skill Zone (Dublin) and Pure Skill (Galway) are indoor sport circuits. There are several sports challenges ranging from rugby, soccer, tennis. golf, Gaelic, basketball, wall climbs and much more. If you want to try a fun eighties style form of exercise, roller skating is an entertaining night out with friends or family. Centres such as The Rink at D12 run adult and child lessons, the hardwood floor rink is also used for a variety of dance fitness classes. See also: Spin Activity Centre (Dublin & Kildare), The Rink (Armagh), Activate (Waterford), Roller Jam (Cork & Limerick). You can enjoy ice-skating outside of the Christmas season! 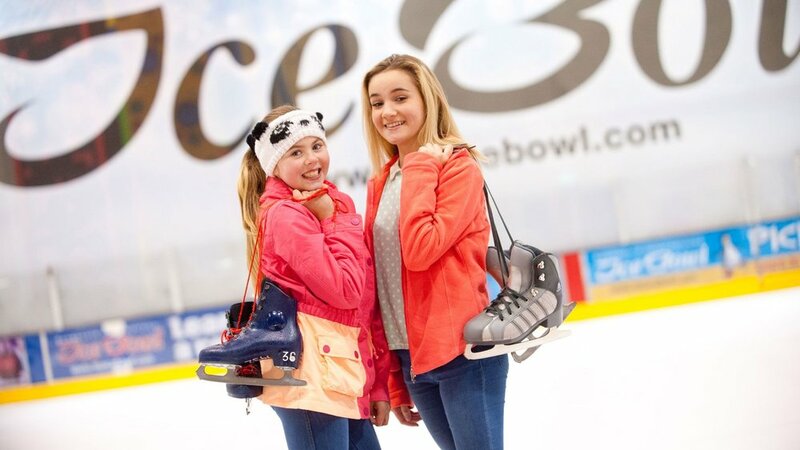 While you’ll still have to wrap up warm, you’ll be protected from the rain at permanent ice-rinks such as at Dundonald Ice Bowl in County Down. Hire some skates and at the regular public sessions, or also a music and DJ during the weeknights and weekends. Skating lessons last half an hour over 6 weeks, available for Grades 1 through 10. While it is often bitter outside, it is rarely cold enough to enjoy winter snow sports. Indoor skiing is a great way to learn, without the need to fly to a ski resort in France or Austria. Using artificial slopes at the Ski Centre in Dublin, you can take lessons to learn the correct skiing posture, breaking and plough turns. See also: Ski Club of Ireland (Dublin). Awesome Walls are in both Dublin and Cork. They are the largest indoor climbing centres in Ireland and include over 200 routes. Rock climbing is fun and also challenging, working your arm and leg muscles especially. They offer one-time sessions, equipment rental, classes and memberships. See also: Foyle Arena (Derry), Boulderworld Belfast, Clip ‘n’ Climb Belfast (Antrim), Gravity Climbing Centre (Dublin), Suas Climbing Centre (Limerick), Upper Limits (Tipperary), Explorers World (Kerry). Indoor trampoline parks take all the fun you had on the ripped and creaky trampolines in your back garden to a whole other level with a room covered floor to ceiling with 14,000 square foot of trampolines. Dodgeball leagues are also run intermittently during the year at Jump Zone. See also: Bounce Zone (Cork), We Are Vertigo (Antrim), Air-Tastic (Antrim, Down, Armagh, Cork) and Airbound (Louth). Want the thrill of formula one type racing? Get competitive by racing your friends around the track. Great for families, children, adult groups or individuals. Kylemore Karting (Dublin) has exciting tracks with flyovers, hills and banks. See also: Galway City Karting, Carrick Indoor Karting (Leitrim), Campsie Karting Centre (Derry), Formula Karting (Down), Need4Speed (Antrim), National Karting Centre (Cork, Limerick) Delta Karting (Limerick), G2 Adventure Centre (Carlow) and The Zone (Meath).